Rounding out the hat trick of announcements, Shout! 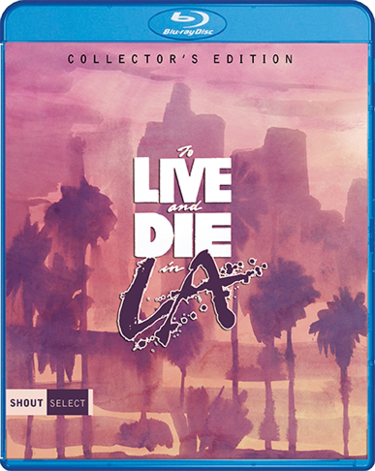 Factory has announced the special features for To Live and Die in L.A., which is being released under their 'Shout! Select' label. The blu-ray will hit stores November 22nd, 2016. William Petersen (Manhunter) and Willem Dafoe (John Wick) face off in a deadly game of cat and mouse in this "riveting" (The New York Times) action-thriller from the Oscar-winning director of The French Connection. This raw tale of corruption and revenge features one of the most harrowing car chases ever caught on film and a shockingly explosive ending. Federal agent Richard Chance (Petersen) has a score to settle, and he's through playing by the rules. Whether that means blackmailing a beautiful parolee, disobeying direct orders or hurtling the wrong way down a crowded freeway, he vows to take down a murderous counterfeiter (Dafoe) by any means necessary. But as the stakes grow higher, will chance's obsession with vengeance ultimately destroy him?